Explicitly as clear text on the command line. Explicitly as an encrypted token on the command line. The command line arguments shown are exactly the same data that is required to launch CopyStorm/Director. To launch with an encrypted token requires a bit of setup but keeps intruders from seeing a visible password. The credential token is a DES-256 encrypted string. 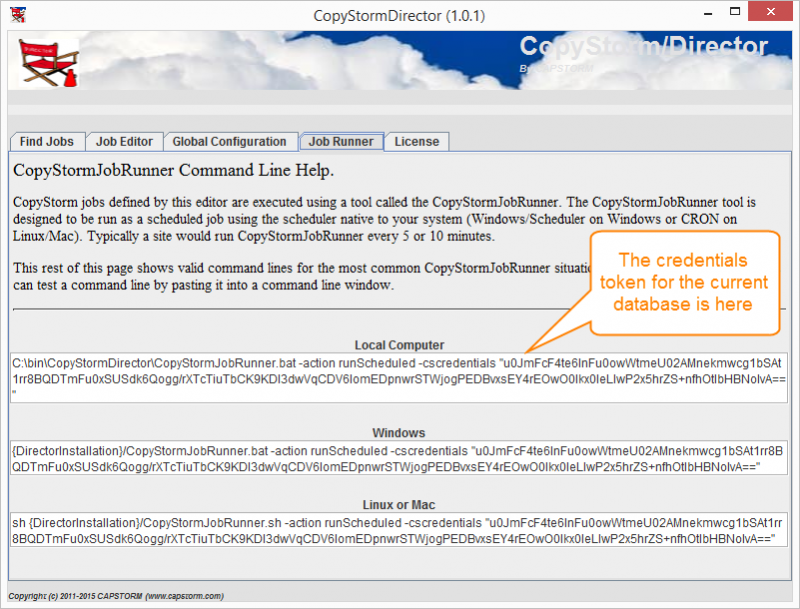 Opening the Job Runner tab on the CopyStorm/Director GUI and copying the generated token. Running CopyStorm/JobRunner on the command line with clear text credentials and the action “-action makeCredentials”. Approach 1: Copy a Credentials Token From the CopyStorm/Director GUI. Capstorm recommends that an encrypted token always be used. However, anywhere CopyStorm/Director database are illustrated in the documentation, either form of credentials may be used.